When the Boy Scouts of America made the decision to welcome gay scouts, some religious groups darkly warned of a mass exodus. While most major denominations have indicated their intent to stay with the scouts, Roswell Street Baptist in Marietta, Ga publicly severed ties with the Boy Scouts because of the new gay policy. Yet across town One World Spiritual Center had the opposite reaction. 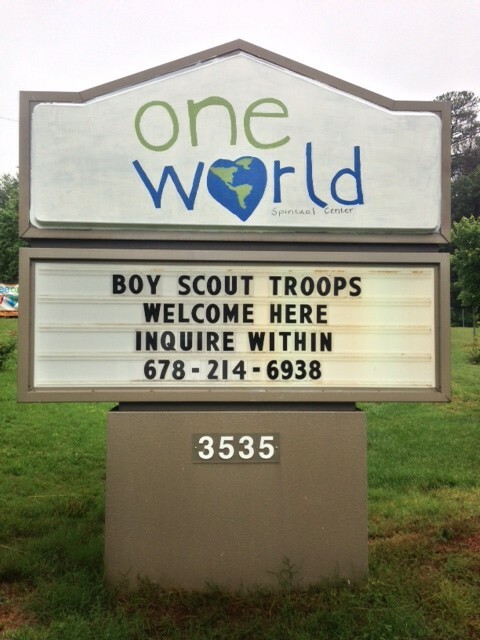 "We put the sign up after hearing that a couple of churches in the metro-Atlanta area had asked their Boy Scout troops to leave after the ruling by the national organization allowing gay young men and boys to join the scouts," Senior Minister Rev. Stephanie Seigh, told The Huffington Post. "We wanted the scouts to know that we were a spiritual community that would welcome them."